She was so proud of her son. I‘m very proud to be involved in this project. People in the city are very proud of the new opera house. You should be proud of your achievements. Don’t be bashful about showing others what you can do. 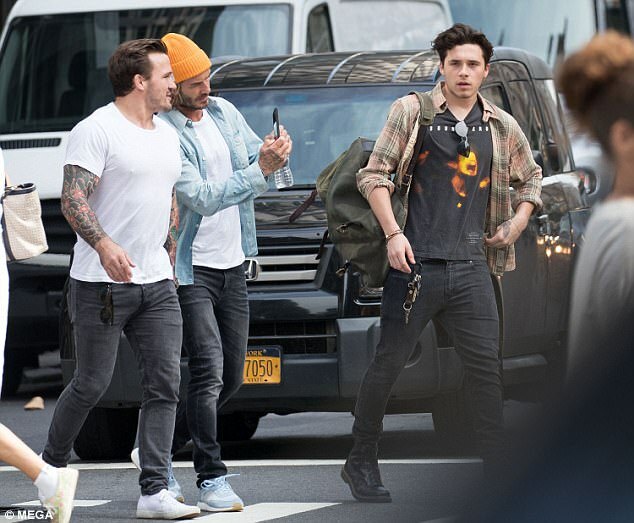 Exciting times await for Brooklyn Beckham as he prepares for his first year of academic study in New York City. 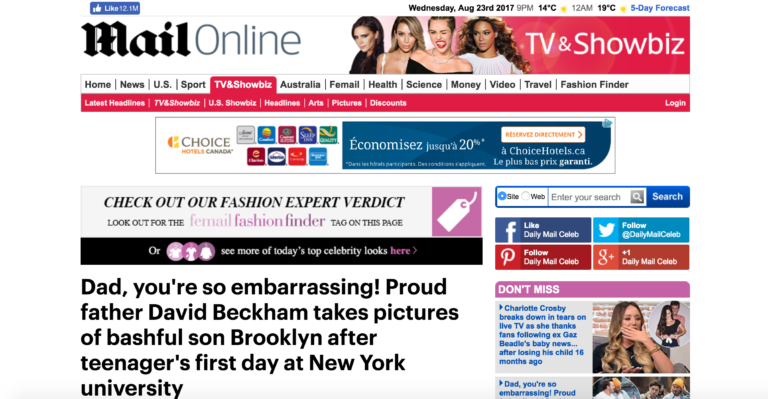 And much like any proud father, retired footballer David was evidently keen to document his oldest son’s first official day as a student following his enrollment on a photography course at the prestigious Parson’s School of Design. The former Manchester United and Real Madrid midfielder, 42, couldn’t resist taking pictures of 18-year old Brooklyn as they familiarised themselves with the school’s Greenwich Village surroundings. A surprise awaits her when she gets home. Joan wanted to go to a movie but I wasn’t keen (= I didn’t want to go). She‘s keen on (playing) tennis. Her report documents the effects of climate change. The study documents various aspects of Indian life in this period. Enrollments at medical schools are down this year. We have enrolled eighty children in this day-care program. He enrolled at Penn State University. Andrew cannot enrol at his local school because the class is full. Isabelle enrolled her brother in a training programme for engineers. It’s my job to familiarize new employees with office procedures. I need to familiarize myself with the subject first. We spent a few minutes familiarizing ourselves with the day’s schedule. Our new surroundings are a lot more friendly than we expected. They live in very comfortable/pleasant/drab/bleak surroundings. She smiled affectionately at him. Some people referred to them as freedom fighters, but to me they were terrorists. Enjoying a day out with his famous father shortly after his first day at the design school, Brooklyn looked typically casual in a grungy Soundgarden T-shirt that showed off a selection of his recently acquired tattoos. Brooklyn added to his look with a pair of skinny black jeans, while a retro plaid shirt and Doctor Marten’s boots rounded things off. He acquired a reputation as an entertaining speaker. The arrival of five more guests only added to the confusion. We rounded the meal off with a chocolate and rum cake. To round off her education, her father sent her to a Swiss finishing school. They rounded off their six-match tour with a brilliant victory yesterday. Accompanied by a tattooed friend, the pair appeared to be in high spirits as they mingled with pedestrians during their latest appearance in New York. But David was clearly keen to capture every moment of his son’s special day by persistently taking pictures of the bashful teenager as they crossed a bustling street. Meanwhile a clearly oblivious Brooklyn walked ahead of his father and their male friend, a heavy rucksack casually clung across one shoulder. The prince is always accompanied by his bodyguards. Visitors must be accompanied by club members. “May I accompany you to the ball?” he asked her. I have two tickets for the theatre on Saturday evening – would you like to accompany me? The salmon was accompanied by (= served with) a fresh green salad. He seems to be mingling with the other guests. Try to get the guests to mingle. The event intends to give you a chance to mingle with other students. The two flavours mingle well. Leave the dessert overnight for the flavours to mingle. Her excitement at starting the new job was mingled with fear. We got so wet that our clothes clung to us. One little girl was clinging onto a cuddly toy. She clung to my hand as we entered the doctor’s surgery. They discovered four men clinging to a piece of wood in the choppy seas. Located in Greenwich Village, Parsons Private Art and Design School is one of the most prestigious art schools in the world. But while most students are gearing up for student dorms, it was recently reported that Brooklyn planned to get his own apartment during his university stint. 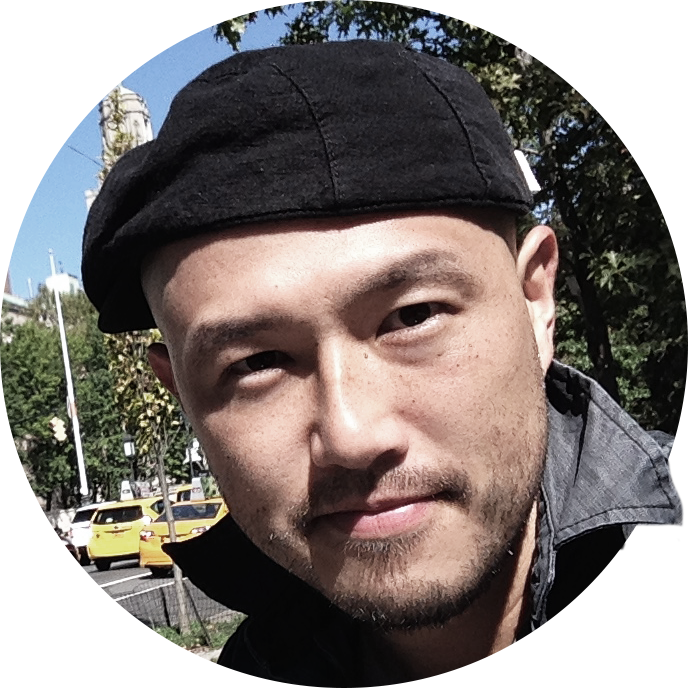 He came to California after a brief stint as a waiter in New York. He took up boxing during his stint in the army. Sharing her elation at her son’s academic success earlier this week, his mother Victoria, 42, posted an emotional photo of her and Brooklyn to Instagram, ahead of his move. Brooklyn recently discussed his move to NYC, and admitted he was anxious about living so far away from his parents and siblings – brothers Romeo, 14, and Cruz, twelve, and sister Harper, six. He also joked that he is often left red-faced when Victoria encourages him to use his budding photography skills at her launches. You need to make plans for your future. You cannot live just for the moment! He lives only for the moment. He’s had a lifelong interest in science. Nick was enthusing about how well things had worked out. He was enthusing over a wonderful restaurant he’d been to. I can’t wait to get all this housework out of the way.